Enjoy Your Colorful Life, Just Start From Unpopular LED Car Interior Atmosphere Decorative Light. An easy way to install it in your car, no need to modify the wiring,simply peel off the double-sided tape behind each strip and apply the LED strips under the seats or in the footwell area. Remote Control: Power on/ off; Color changing; Flashing & Fade; adjust luminance; Strobe & Smooth. Wireless music control 8 color RGB car interior lights kit. 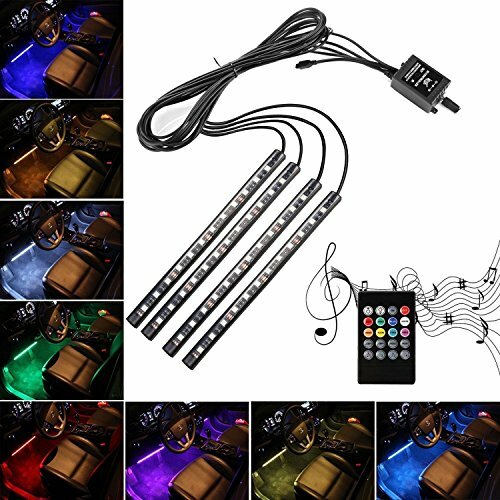 High quality RGB LED strip lights, waterproof, anti-collision, anti-corrosion. With 3m sticker on the back of the light, easy to install.